The story of the rise of Lakshmi Mittal is quite fascinating. Born in India in 1950, Laxmi Mittal, popularly known as Metal Guru, started managing his father's steel business in the '70s, right after graduating from college. Later his father assigned him to look after his steel business in Indonesia, where he proved his talent. Instead of traditionally used scrap metal as raw materials, he started using Direct Reduced Iron or DRI, then a new product in the industry. This new dimension in the business turned out to be a great success for Mittal. Eventually, Mittal concentrated to turn around a loss-making steel mill in Trinidad & Tobago under a contract with the government. Mittal brought steel experts from all around the world and pumped in millions of dollars to make this project a success. The mill started generating profit within one year. Later, Mittal acquired the mill in 1989. During the next decade or so, Mittal followed the same strategy of acquiring troubled steel mills in Mexico, Canada, Germany, Kazakhstan, the United States, Romania, Czech Republic, Poland, Macedonia, Bosnia, Algeria, Ukraine and South Africa, one after another. Profit made from one entity was invested to acquire another entity and the process of new investments went on. So by the time the steel price shot up from US$ 300/tonne to as high as US$ 600/tonne during 2003-2004, Mittal was amply ready to reap the most benefits. By that time, Mittal-owned steel conglomerate already was one of the leading steel makers of the world. Following this unprecedented cash-in opportunity of lifetime due to price hike in steel, Forbes named him the third-richest billionaire in the world in 2005. The following year, he set another major milestone. He announced his bid for acquiring European steel giant Arcelor for a price of US$ 22.8 billion in 2006. The resultant entity, ArcellorMittal S.A., thus became the world's largest steel-making company. The story of all successful entrepreneurs who eventually made headlines for their achievement is almost the same. They started producing a certain product, involved their business acumen to make the venture a success, cashed in profits from one business and eventually deployed this excess reserve to another opportunity to make their empire even bigger. This would not have been possible if they were unable to sell their products with a certain margin over the cost of production. Generating sustained profits was the key to their success. The same formula does not work for the farmers though. Farmers produce crops, which is the most important product for our survival. However, we rarely see farmers become millionaires or billionaires like other businessmen. Farmers can be compared to any other entrepreneur because they also need to make investments for the cultivation, employ their business skills to have a good harvest at the end of the season, and sell the harvested crop with certain price tag on it in the market to recover their employed capital. Take the example of a rice farmer. In many countries, rice is the staple food. For producing rice, a rice farmer needs to invest his capital to prepare the land, employ labour, and arrange seeds, pesticides and all other raw materials for producing rice. At the end of the crop season when the paddy is grown, they convert it into rice through the rice mills and then sell them to the market with certain price. During the last few decades, we have seen sudden rise of rice prices in different time periods. During 1972-1974, the price of milled rice rose to as high as around US$ 680/tonne. Thereafter, rice price remained stable until 2000, and since then it has started to rise again and reached the peak of over US$ 1000/tonne by May 2008. Now if the same formula of business success works for farming, we should have seen many farmers reaping the benefits of such price hike and becoming millionaires and billionaires. However, do we really see successful farmers like this all around us? If not, then why? The answer of this question is the main focus of today's article. Farmers have to rely on weather for a good harvest on which they have very little control. They lose crops if there is a flood, cyclone or drought. In order to recover the loss of a poor harvest in one season, they sometimes have to take out loan from loan sharks at a very high interest rate. During the next season, when the crops are harvested, they have to sell them to the market intermediaries at throw away prices because they are required to repay the debt as soon as possible. If they don't, their interest burden will keep rising. Market intermediaries or traders know these financial weaknesses of the farmers and they take the advantage of this distressed situation by offering a very low price. Farmers can bargain for more prices if they have the ability to store the harvested crops, but unfortunately, most of the farmers don't have sufficient storage capacity. This is another reason why their bargaining power in the market remains low compared to the traders. After keeping the reserve for household consumption, they are compelled to sell the excess produce at a price, which is not even sufficient to recover the cost of production. The government policy also sometimes works against the interest of the farmers. If there is a shortage of crops in a certain season, to ensure food supply for the mass people, governments reduce import tariff that depresses the market price. So during the next season, even if the harvest is good, due to the depressed market price, farmers don't get their required minimum return to sustain the business. In such cases, governments act against the interest of the farmers because most of the consumers or voters are not farmers, rather consumers of crops. Many of these consumers are social elites who rule the society. So the interest of the government is always aligned to make this non-farmer class happy. For making such losses over and over again, the farmers at the end accept the defeat and move out of this very important profession. They move to the cities and eventually become day labourers, industry workers, riskshaw pullers, and many of them also leave the country by selling off their farming land. This causes continuous urban migration. The story is the same no matter it is Mumbai, Karachi or Dhaka. Now if the market dynamics could ensure that the farmers would at least obtain the minimum required return to recover their cost of production, this situation could have been reversed. We would have seen villages becoming growth centres automatically, and farmers becoming wealthier day by day. This would have accelerated the rate of poverty reduction in rural areas through multiplier impacts and less developed countries would have become rich very quickly. In this article, we have attempted to show that this reversion would not be possible under free market forces. There is a need for strong intervention of the government to reverse the trend. In order to prove our stance, we have used the analysis of rice marketing value chain in Bangladesh as a proxy for all crops to determine the status of fair price dynamics of farmers. The use of rice market value chain as a proxy here is quite logical as it is widely believed that rice market is the most efficient and most integrated amongst all crop markets in Bangladesh, and therefore, weaknesses identified in this market can be assumed to persist in all other crop marketing system as well. We have analysed the "Farmers' Share in Consumers' Prices" or FSCP for rice over a few decades to see how this share evolved over time. We can fairly assume that FSCP denotes the bargaining power of the farmers in the market. If the consumer pays Taka 100 for a kilo of rice, and the farmer receives Taka 80, then Farmers' Share in Consumers' Prices or FSCP is 80 per cent. The higher the share is, the better is the bargaining power of the farmers and vice versa. On the other hand, the higher the FSCP, the lower is the market power of the market intermediaries or middlemen who act in the marketing chain to take this rice from the farmers to the consumers. In an efficient rice market where there is no regulation and the market operates freely, there will be many such market intermediaries and higher competition amongst them will help the farmers obtain the most share in consumers' prices over time. This is the conventional wisdom. In the following sections, we have analysed how this bargaining power of the rice farmers in Bangladesh changed during the last few decades. For this, we have used a number of studies in different time periods. The first study that we have analysed is titled "A Benchmark Study of Rice Marketing in Bangladesh" authored by M Aminul Islam, Mukarram Hossain, ASM Nazrul Islam, Shaheen Akhter, M Eusof Harun and J Norman Efferson. The study was conducted by Bangladesh Rice Research Institute (BRRI) in 1983 and was published in 1987. The study was quite comprehensive as it covered all regions of Bangladesh, except Chattogram Hill Tracts. The study found that during 1983, the rice farmers used to get around 71.07 per cent of what consumers used to pay for rice at the retail level. There were indications that there were around 4-5 marketing channels available for bringing rice from the farmers to the consumers, and if the farmers could use shorter marketing channels, they could fetch around 80 per cent of the consumers' price. The next share was for the millers with around 14.21 per cent of consumers' price. The study found that in some cases, farmers were milling their rice themselves and selling the rice as retailers that could earn them the whole 100 per cent of the consumers' price. The study concluded that at that time, due to the higher FSCP, Bangladesh's rice market was one of the most efficient in the world. At that time, the comparable share in Thailand was around 60 per cent and in the US, it was as low as 50 per cent. We analysed the same FSCP during 1999, which appeared in a research paper in 2004 that was written by Mohammad Ismail Hossain, Mohammad Nurul Huda, Esmat Ara Begum and Md Golam Rabbani. The study covered Sherpur, Jamalpur and a few areas of Mymensingh district. The study revealed that during 1999, there were four marketing channels that brought rice from the farmers to the consumers. The longest route provided the farmers a share of around 71 per cent of consumers' prices. The corresponding share of the farmers in the shortest route was around 82.5 per cent. The share of the millers in the consumers' prices was between 7.95 per cent and 9.18 per cent. The retailers' corresponding share in the consumers' prices was around 3.63 per cent to 4.02 per cent. A similar research was conducted by a group of researchers at the Centre for Policy Dialogue (CPD) in 2007 that found the FSCP to be 61.2 per cent, while the same share of the millers was around 22.9 per cent. The corresponding share of the retailers was around 12.2 per cent. 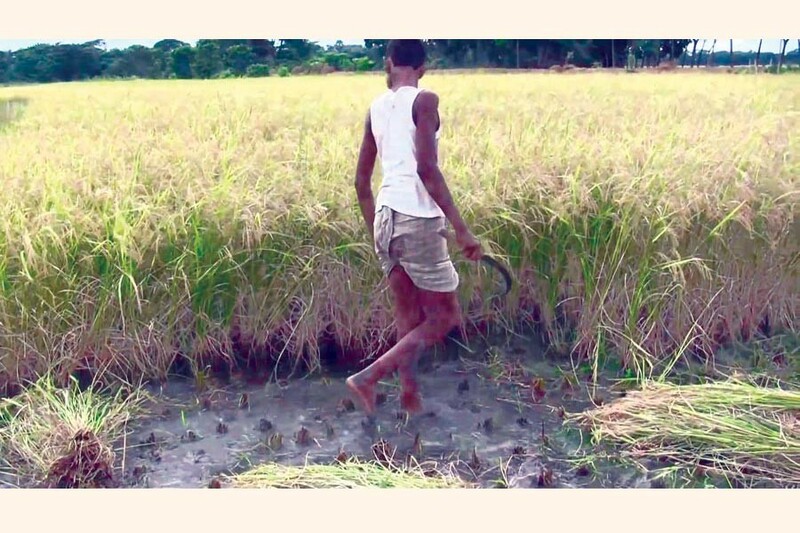 The study covered 12 districts of the country and during the research, it was found that there were eight marketing channels that helped the farmers to market their rice to the ultimate consumers. The title of the research was "Price of Daily Essentials: A Diagnostic Study of Recent Trends". We are comparing another research that was conducted by the researchers of Institute of Agribusiness and Development Studies (IADS) of Bangladesh Agricultural University. The title of the research was "Structure, Conduct and Performance of the Rice Market and the Impact of Technological Changes in Milling" by Professor Dr Shankar Kumar Raha, Md Moniruzzaman, Professor Dr Md Monjurul Alam and Dr M.A. Awal. The study was conducted in 2012 covering 12 districts of Bangladesh and it was published in June 2013. The study found that during the period, there were thirty five marketing channels for rice. Although the study did not provide any estimate of FSCP, it revealed that the net marketing margins of the millers were the highest amongst all the traders in the rice marketing system. The study calculated the Internal Rate of Return for various rice mills, and found that the IRR of automatic rice mills was as high as 32.54 per cent, indicating very high profitability. One of the distinguishing features of this research is that it compared the number of rice deficit and rice surplus districts of Bangladesh in three time periods, i.e., 2000, 2005 and 2010. In 2010, amongst 64 districts, 36 (56 per cent) were found to be rice surplus districts while the remaining 28 (44 per cent) were rice deficit districts. Between 2000 and 2010, the extent of deficit in Chattogram has increased; Sylhet was a surplus district in 2000 and 2005, but it became a deficit district in 2010. It also shows that there is a very high probability that in the near future, nine other districts will also be deficit districts in terms of rice production. If it happens, then the majority of the districts in Bangladesh would become rice deficit areas. The next study that we are analysing here is titled "The Transformation of Rice Value Chains in Bangladesh and India: Implications for Food Security" by Thomas Reardon, Bart Minten, Kevin Z. Chen, and Lourdes Adriano. The study covered Naogaon district in 2009. The study concluded that the rice farmers have been shifting their production to a finer quality of rice over time. The study shows that between 1999 and 2009, more farmers have switched from producing coarse rice to common rice and fine rice. However switching to fine rice did not give them the adequate reward in terms of higher share in consumers' price. Although for common rice, the share was around 79 per cent, for fine rice, the corresponding share was only 52 per cent. Another study conducted in 2010, however, gave different results. The study is titled "Assessment of the Channel of Rice Marketing: A Case Study on Jashore District" by Shaikh Moksadur Raham, Syeedul Al-Amin and Manika Chakraborty. The paper was published in April 2013. The study area covered two villages in Jashore district. The study found eighteen marketing channels for rice, of which sixteen was used by the farmers to sell unhusked rice, while the remaining two were used for selling husked rice. The study found that for selling unhusked rice, the FSCP varied between 46 per cent to 54 per cent, while for selling husked rice, the share increased to as high as 92 per cent to 98 per cent. Although the farmers knew very well that selling husked rice could give them higher FSCP, most of the farmers had to sell unhusked rice due to various social and economic constraints, the study concluded. 5. In the future, more districts will likely to become rice deficit areas and if the trend is not reversed through the adoption of higher yielding varieties and encouraging farmers through giving them adequate financial incentives, the country would face shortage of this staple crop in the near future. Now it is quite clear that allowing the rice market to operate freely with the help of market forces will not ensure better market power for the farmers. If the trend continues, we might see the FSCP falling to as low as 30 per cent -40 per cent in the near future, and if this happens, more farmers will leave the farming profession, causing shortage of food supply for the masses. Now if the government intervenes in the rice market, then the question is, what should the extent of such intervention be? One such intervention is already taking place through the setting of minimum procurement price for rice from the farmers. The price is set in a manner that would ensure covering the cost of production with some profit margins. However, it can be argued to what extent such setting of minimum price can benefit the ultimate consumers. If the price is set at a too high-level without fixing the market inefficiencies, the intermediaries would still be charging higher rates to the consumers, and as a result, the consumer would be compelled to pay higher price for a kilo of rice, which could have been bought at a much cheaper rate if the market corrections could take place. Another way of government intervention is through setting a higher tariff rate for imported rice that will raise the market price of rice, and as a result, the farmgate price would also increase. But such intervention would also backfire because in the medium to long run, such artificial hike in prices would cause inflation that would increase the cost of production for the farmers, causing erosion of the added margins of the farmers. This will also affect the interests of the consumers because they have to pay higher price for the same amount of rice that could be bought at a cheaper rate if the tariffs were lower. Both these interventions have been practiced by Bangladesh government in recent past to ensure fair price for the farmers. It needs to be analysed to what extent the farmers as well as consumers truly benefited from such fiscal interventions. Another way of market intervention by the government is through establishing regulated markets all over the country where the market dynamics would be regulated by the government so that the farmers are not abused. This practice is already there in our neighbouring India. Taking the lessons learnt from regulated markets for cotton in the British era, the government of India gave importance to ensure the fair price for the farmers since the beginning of independence in 1947. By the time the First Five Year Plan of India was adopted in 1951, the number of regulated markets rose to 470 all over India. In 1963, a new law titled "Agricultural Produce Marketing Act (APMC)" was promulgated to bring those markets under specific regulations. During the last few decades, the total number of such regulated markets grew significantly and by the end of 2010, there were 7,157 regulated markets in India. The Indian government monitored the activities of such regulated markets quite extensively and brought reforms to modernise their activities and make them more market-oriented. Thus, the concept of "Modern Terminal Market" evolved. We first came across this new concept back in 2009 when we were conducting research on this particular matter. At that time, there were couple of media reports published on the plan of implementing Modern Terminal Markets for ensuring fair price, mainly for horticulture products. The concept was one step ahead of already existing regulated markets. It envisaged that such modern markets would be established in major urban centres, and these will be connected with collection centres under "Hub and Spoke" format. The farmers will bring their produce to the collection centres and eventually these will be transported to the urban centres. However, exactly how these market would operate was unclear and no details were provided at that time. Later, we found the reference of such modern markets in India's Twelfth Five Year Plan (2012-2017) that reflects that the Indian government brought this initiative under its national development agenda. It was envisaged that such modern terminal markets would be established under Public Private Partnership (PPP) format where the government would provide the required land, while the private sector would invest in building the necessary infrastructure. Now since India has already experimented government intervention in the crop market in a more profound manner, let us see how these impacted the farmers in terms of having more bargaining power. In a case study titled "Farmers' Perception towards Regulated Markets" written by N. Sakthivel and Dr A. Selvaraj, it was revealed that almost 52 per cent farmers of a particular regulated market in Tamilnadu were satisfied with the performance of the regulated market, while 30 per cent were moderately satisfied and 18 per cent were less satisfied. Although these farmers were selling cotton, not rice, we can use these data as a proxy for the entire crop market in India. To analyse the returns for the rice farmers under these regulated markets in India, we are analysing another study titled "Cost, Returns and Marketing Channels of Paddy in Thiruvarur District (Tamil Nadu)" written by Dr. Anandaraj P. The study was published in November 2015. The above table clearly shows that the unregulated markets involving commission agents and the retailers/millers are the most preferred marketing channel for both small and large farmers. However, the most striking feature of this finding is that the bargaining power of both large and small farmers, reflected through their respective share in consumers' prices, is higher compared to Bangladeshi farmers as of 2015. Moreover, for India compared to Bangladesh, the unregulated market is more favourable for the farmers in terms of ensuring higher share in consumers' price. Now, the question remains: Is India's overall rice market operating more efficiently in favour of the farmers compared to Bangladesh just because the market remained regulated by the government for many decades? Is India's unregulated rice market operating more efficiently in favour of the farmers compared to Bangladesh just because there is a rival regulated rice market still operational? 5. If the farmers are not rewarded enough for their investments made, they will lose interest in farming profession, and they will tend to switch to other professions. After leaving this very important profession, they will become day labourers, riskshaw pullers, garment workers, and some of them will move abroad. As of 2016, the population of greater Dhaka stood at around 180 million, which was increasing at a rate of 4.2 per cent annually. This growth has been largely propelled by continuous migration from the villages. Nobody knows how many of these incoming people were skilled farmers in the past. 6. Since 2014, Bangladesh has sent around three million workers abroad, most of which have been recruited in low skilled labour jobs. Nobody knows how many of them were skilled farmers in the past and were compelled to leave this strategically important profession just because of the market's failure for ensuring fair market price of crops. We are quite delighted to have remittances from abroad by sending these labourers for sweeping the streets in the Middle East, but this comes at the expense of losing precious farmers, who are the backbone of ensuring national food security. From IDEAS FOR DEVELOPMENT (IFD), we have a strong stance for more government intervention in the crop marketing system. The extent of such intervention should be more than the current practice in Bangladesh, but lesser in degree compared to India's regulated market system. We have devised a model named "Bangladesh Accelerated Poverty Reduction Model (BAPRM)" that can be implemented in Bangladesh as well as other countries in South Asia for ensuring fair price for the farmers. Our model is similar to India's proposed "Modern Terminal Market", however, ours is more comprehensive in terms of its operational procedures.